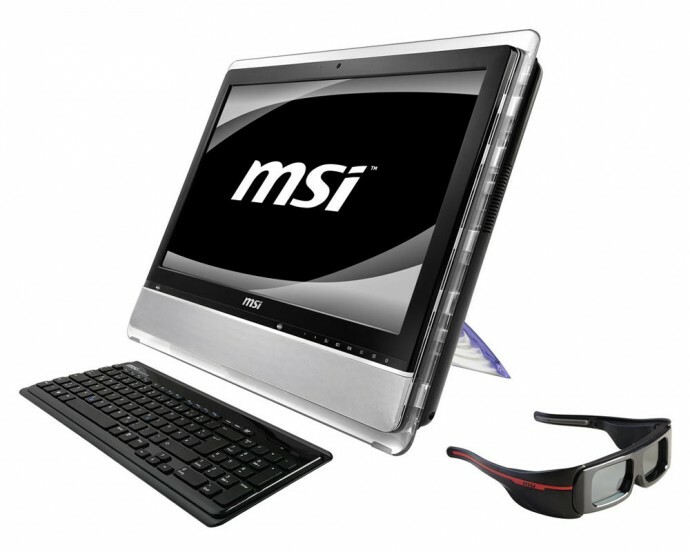 The new MSI Wind Top 2420 3D is apparently the first All-in-One PC that offers stereo 3D support and that also has a Multi-touch capable touchscreen integrated. The PC is equipped with 24-inch Full HD 1080p 3D-capable 120Hz LED backlit LCD panel, and has an integrated Intel Core i7 CPU and whatis interesting the ATI-based Radeon HD 5730 DirectX 11-capable discrete graphics card. We got a hint about that model a while ago thanks to iZ3D who listed some information about it on their website, so this means the AIO PC will be actually the first to offer stereoscopic 3D capabilities with shutter glasses and using ATI-based GPU thanks to the iZ3D driver. There are still some details unknown, but since the AE2420 3D-046US 3D-capable PC is already available for same from today in North America, we are probably not going to have to wait too much before someone gets it for a review or buys it and shares more information on the stereoscopic 3D implementation and capabilities it offers. Amazon already has the MSI AE2420 3D-046US AIO PC listed with a price of $1,799.99 USD. The configuration seems quite Ok for multimedia use like movies and photos in 3D and a little gaming in stereo 3D mode, but the Radeon HD 5730 graphics card is not the best choice for primary gaming solution even when not in stereo 3D mode, let alone for playing comfortably games in S3D mode with high-details and with Full HD resolution.